Artists, layout people and graphic designers have new power, flexibility and ease of use at their mousetips with CorelDRAW X5. Corel switched from straight number to the "X" factor with version X3, which followed v. 12, possibly for the same reason there aren't many 13th floors in buildings. Version X5 not only moves the product forward, it also takes an interesting and welcome step backward, because it comes with a hardcover manual the likes of which we're seeing less and less of these days as companies offer either online or PDF manuals. Both manual types have their advantages. Online and Acrobat files are easier to manage, cheaper to publish (and kill fewer trees, if you're into that kind of thing) and are more easily searchable than a print manual. On the other hand, I like being able to sit the print manual beside me on the desk and look at its hints while my document is open in front of me on the screen. Fortunately, Corel gives you the best of both worlds, with a typical Help section that includes video tutorials as well as the classy-looking manual. Corel says the new DRAW comes with more than 50 new and/or enhanced features, including major tweaks to its asset and color management systems and with more value-added content than ever. Corel generally throws in an abundance of content, via clipart, images, fonts and the like, so this continues a long time trend. I've been using the suite since version 3 and, though I'm more or less a hack when it comes to creating truly great work with it, I've used DRAW to design logos, greeting cards, newsletters, graphics for print and the web and even some designs from which I later created websites. It's a very powerful application that combines a lot of the functionality of such apps as Adobe Illustrator and InDesign into a single application. I also know people who have used the app for designing and creating sew-on crests, for reproducing logos and insignias for models, and more. 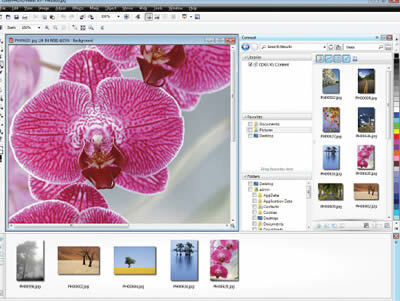 Photo-Paint – Corel's competitor to Photoshop – is another app I use often, for creating or enhancing web graphics. Just yesterday I used Photo-Paint's clone feature to remove a sign I hadn't noticed when my daughter-in-law took a car photo for my website. That, of course is just one of its many basic features, and a darn handy ones. The other app I use sometimes is Corel Capture, which lets you perform screen captures of whatever you're looking at and which will then either send it in to Windows clipboard or to whatever photo manipulation app you want (I'm sure Corel would prefer if it were Photo-Paint, but it works with others as well). And Corel's Trace feature, now called Power Trace is a neat way to take a bitmap and turn it into an editable vector graphic. I've used this to turn a photograph into an artsy-fartsy version of itself, and it's pretty neat. Corel says the new version focuses on "Innovations that matter the most to users in a wide variety of industries, including sign making, graphic design, fashion/apparel design, wide format printing, marketing, print production and other businesses of all sizes." Their press blurb says they worked with their user community to make sure that, rather than just piling on new stuff, the new features and enhancements would make a real difference. "We wanted to truly understand what they loved about the product and what they needed to make their experience that much better," said to Gérard Métrailler, Senior Director of Product Management, Graphics, for Corel. "We believe we've delivered a product that enables our current users to discover new possibilities with the suite while allowing new users to get up and running quickly and create projects with confidence." The result of their work is some nifty tweaks the company says are focused on five areas their users said were priorities for them. And an easier and more intuitive interface that does help you get a sense of direction in the product more easily than before. For ease of use, Corel has enhanced its already pretty good tool tips to make them more readable and provide more information. Now, when you position the pointer over an icon or a button, a tooltip appears describing the tool and its purpose. One less reason to need that fine manual! X5 introduces a new "create a new document" dialog box that gives you a variety of presets for page size, document resolution, preview mode, color mode and profile. And, in a nice "hello!" to new users, the "Description" part of the box describes what each parameter is all about, changing as you move your cursor over the various choices. For instance, if you put your pointer over "Primary Color Mode" you get the description "Choose a primary color mode for your document. The default color mode affects how colors are blended together in effects such as fills, blends, and transparencies." And the "Create a new image" dialog box in Photo-Paint now matches that of DRAW, providing information such as color mode and profile. Another reason not to need that fine manual! I sense a theme here. Actually, that's not quite fair. The Guidebook is really helpful because it walks you through all kind of tasks, from beginner to expert, organizes many of them by genre (jewelry design, book cover design, etc.) and also gives you tips from professional designers who supposedly use the suite. There's also a quick reference card. 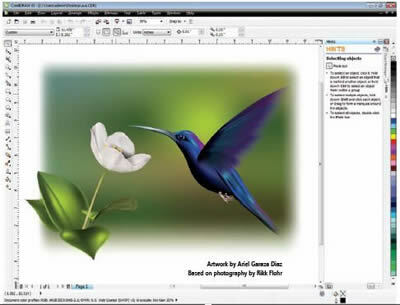 Corel CONNECT synchronizes with DRAW and Photo-Paint to give you quick access to content, whether it's on your computer, your network, or some other storage device. It works as a full-screen browser or a docker through which you can browse for content or search via category or keyword. VSTA (Microsoft's Visual Studio Tools for Applications) integration is new, as is a Macro Manager docker, which lets you record, organize, view and play macros from Draw or Photo-Paint more easily. There's also a bunch of new or updated artistic media, scalable arrowheads (great when you're making things like flow charts), as well as enhanced Connector and Dimension tools. They've also improved the Mesh Fill tool to let you design multi-colored filled objects with better transitions between colors. New web graphics tools let you work better in bitmap mode in Draw, without having to fire up Photo-Paint, which is a nice enhancement. If you want to take advantage of the extra power in Photo-Paint, you can launch it from inside DRAW. I'm not overly enamored with their design templates, but they're certainly better than a kick in the face. CorelDRAW! X5 also offers support for more than 100 file formats, which makes sharing files with people – or printers – using other apps much easier. Corel has always been good in this department, and they just keep piling on the compatibility. I've had occasion over the years to import from or export to such formats as AutoCad, PNG, rich text format and Microsoft Word as well as the common jpg, PDF, Windows Metafile, Gimp, etc. It's marvelous flexibility. The Suite X5 also provides enhanced support for the latest Adobe Illustrator, Photoshop, and Acrobat versions, which means you can import and export PSD files and CorelDRAW will preserve the appearance of adjustment layers and Masks palette effects. Photo-Paint, meanwhile, preserves editable vibrance, grayscale, and camera filter lenses of imported and exported PSD files. There's lots more but, since I'm not anything close to expert at design, many of the tweaks are over my head. But real pros will probably find a lot here to love. In short, it's a typical CorelDRAW upgrade – taking an already great product and making it even more powerful and easier to use.